Full disclosure: I’m clueless when it comes to lighting grills, be they charcoal or gas. As such, I never realized there’s a heated debate (pun totally intended) over what kind of charcoal one uses, should that be the grill of choice. I see chunks of black stuff on fire cooking up a burger and I think, “Yum. Gonna eat that.” But it’s true, dear readers — there’s a battle brewing between charcoal lump fans and charcoal briquette devotees. This weekend’s Memorial Day festivities will no doubt include grilling up meats, veggies, heck, even pizzas, but what will you use to keep your fire blazing? NPR walks through all the viewpoints in the lump/briquette dilemma, noting that it can be a confusing quandary for those not in the know. For example, briquettes burn more consistently because they’re pretty much a uniform size and shape. However, they contain additives and create more ash when they burn. Lump coal can burn hotter, and come in a variety of different woods that leave a tasty flavor on food. But they’re all you know, lumpy, and don’t always char evenly. Briquettes and instant light charcoal are winning on the sales front, as the made up 94% of all charcoal shipped in 2012. But lump charcoal is comparable to organic food, in that its growing in popularity due to it being labeled “natural.” There are no additives or lighter fluid, which some tout as a sign of its purity. 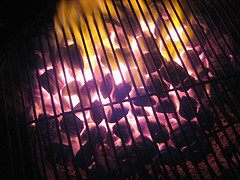 There’s not much evidence as of yet that additives in briquettes have any impact on food, however. So what’s a grilling newbie to choose? You tell me.